Today is the first day of Advent. It’s also December 1st, which is the anniversary of the martyrdom of Charles de Foucauld (1858-1916). Br. Charles chose to live among the Muslims of the Sahara desert at Tamanrasset, Algeria. There, Charles sought to be a living example of the Gospel through his poverty, prayer, and imitation of the life of Jesus. Charles’ imitation of Christ was completed when those whom he had loved and lived among for many years turned on him and shot him on December 1, 1916. Eighty years later, Br. Charles’ story was repeated when seven other Trappist monks were killed in Algeria. Their 1996 martyrdoms were recently made famous by the award-winning film Of Gods and Men. 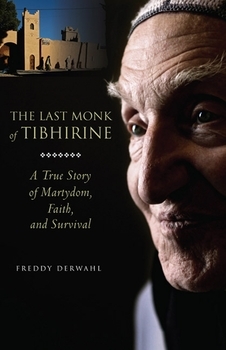 Now a new book from Paraclete Press, called The Last Monk of Tibhirine, now provides even more of the details of their story and, in so doing, sheds light on the enduring legacy of Br. Charles. German journalist Freddy Derwahl wrote The Last Monk of Tibhirine after he traveled to Morocco to visit Br. Jean-Pierre Schumacher, the one monk from the Tibhirine monastery who survived the 1996 attack. In the book, Derwahl tells the story of Jean-Pierre’s whole life, from his childhood, to his entry into monastic life, to his years with the men from Tibhirine who were killed. In one of the book’s many references to Foucauld, Derwahl notes that Jean-Pierre was fascinated by Foucauld’s calling to “proclaim the Gospel from the rooftops, not through words but through the life you live” (p. 47). This humble retelling of Jean-Pierre’s life and the events leading up to the Tibhirine martyrdoms is evidence that Jean Pierre took Br. Charles’ words to heart. The book also sheds more light on Christian de Chergé, the prior of the monastery, who remained persistent in his efforts to build bridges with the Muslims around him, even when his life was endangered. Ever the intellectual, Christian took part in both inter-religious dialogue and times prayer where Christians and Muslims came together to show one another different aspects of their spirituality. Here Br. Charles’ influence is even more clear. Christian once took a two-month retreat to Foucauld’s hermitage at Assekrem during a crisis in his own ministry. He returned with an intensely renewed love for and commitment to his Muslim neighbors. Christian’s later writings display a yearning for total surrender to God, similar to that in Br. Charles own writings: “I have only this short day to give to the One Who calls me every day; however, how could I say yes to Him forever, if I did not give this day to Him” (p. 68). Amid this retelling of Jean-Pierre’s story, and thus the story of Tibhirine, Derwahl tells his own story through a daily journal of his time at Monastere Notre-Dame de L’Atlas, the Moroccan monastery where Jean-Pierre now lives. The addition of this journal has the effect of inviting the reader deeper into the story by illustrating both how Derwahl learns from Jean-Pierre and how he processes the holiness he seems to encounter. Thus the reader begins to feel like a fellow pilgrim, bearing the desert heat alongside Jean-Pierre and his brothers. One finishes the book with the sense that Derwahl’s fascination with these desert monks will bear more fruit in him in the years to come. The attentive reader will find his or her own way into the story, as well, perhaps wondering what such bold devotion to Christ might look like in their own context today. As this happens, successive generations will be inspired to join this spiritual family bold witnesses and follow Br. Charles’ example of imitation of Christ. Thank you to Paraclete Press for sharing a review copy of The Last Monk of Tibhirine with me.